(adapted from African Baby Party, 1956) It’s a love song about a young man asking Emma (his woman) to give him good loving from the bottom of her heart so he can cool his burning heart desires for her. 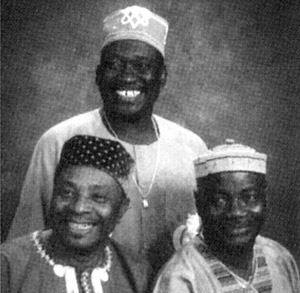 The W.African Hilfe group – African Rhythm Messengers in no doubt lives after their name when one listens to their solid tune. Bottom Belle mixed with W.african Hilife, Soukous and some elements of kwasa kwasa groove. An evidence of innovation of W.African hilife music from the ‘50s to the present day. A dance floor filler no matter which environment or situation, one is bound to move which strictly depicts the power and magic of the African music. African Rhythm Messengers is a strong live act that can entertain any audience upto expectation and plays concerts and festivals when ever they are booked. For further contacts & bookings in Europe: Page2 artists & management or AMUN-African Musicians Union in Norway. Contact pers: Sam U GeorgE, Omari S.Tabu. Tel: 47 48 11 39 96.